Long time no post..and I am back! Unfortunately, work commitments have really took a toll on my time...and I started to neglect my blog :( However, I am back (for now!) and hopefully be able to continue to review more products for you! Lately, I started realising I had accumulated too much make up and skin care at home that I could not possibly buy more to my collection..so I'm still currently using everything I own before purchasing another product. This Too Cool For School Egg Mousse Soap Cleanser I had bought back when I was in Korea in January 2015. The packaging is adorable and it's in a little spray can. 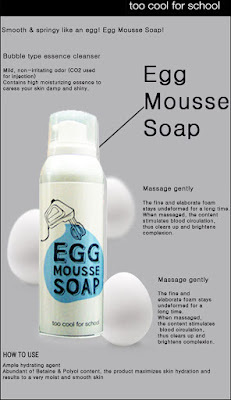 It's basically a foam cleanser in the form made out of egg whites which are meant to be really good for your pores. What i found difficult was learning how to use it - as the instructions were all korean and the words "egg mousse soap" didn't explain much. But after looking online, it seemed like it was super easy to use - just spray on your palm and massage it gently on your face and then wash off! Got lured by the cute packaging :( But I don't think this would be a product i would buy again..It's nice, but I wish it was more effective! !